You know the Orlando/Kissimmee area for its magnificent eco-adventures and proximity world-class theme parks. This November, you’ll also dive into its cuisine when some of the best chefs from across the globe converge and transform the area into the biggest foodie festival of the year. 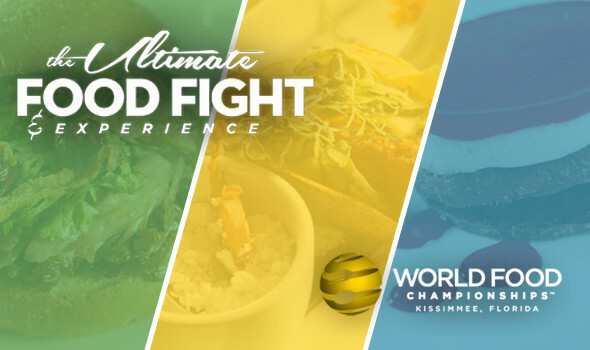 At the 4th Annual World Food Championships (WFC), coming to Kissimmee from November 3 – 10, you’ll be able to sample iconic cuisines from around the world while watching 680 of the planet’s most renowned culinary masters duke it out in nine recipe categories. In three short years, WFC has awarded more than $1 million in prizes and money, spawned a TV series, and launched numerous professional careers for successful contestants. This year, the week-long food fight and festival comes to Kissimmee for the first time. Hundreds of delicious events and demos are planned, making it a gourmet foodie destination for the whole family. In addition to ticketed events, there are many free opportunities to whet your appetite in between chef competitions. In the Tasting Village, event sponsors serve up their sweet and savory morsels. At the Sizzle Station you’ll watch food preparation demos that range from how to grill the perfect steak to how to make the flakiest piecrust. The Swizzle Spot brings award-winning mixologists to the culinary scene with demos on how to create everything from refreshing margaritas to sweet Manhattans. Tons of free family cooking classes let you work one-on-one with chefs who specialize in children’s nutrition. Bring the kids into the kitchen for any of the small culinary arts courses. And if you fancy yourself an expert, you can participate in Food Champ Judging classes. Plus, there are plenty of surprise pop-up dinners planned throughout the week. The championships will turn Celebration’s Main Street into the world’s largest outdoor kitchen. Fifty qualifying contestants from each category compete side-by-side in state-of-the-art Kenmore kitchens. Outside, in front of the crowd, challengers whip up two dishes-the signature dish that earned them their spot and a spontaneous dish involving a surprise ingredient. Signature recipes like Bacon-Fried Tomatillo Stacks with Bacony Crab Cakes & Bacon Slaw earned competitor Sherri Williams an invite to-you’ll never guess-the WFC bacon category. Nancy Manlove’s recipe for Steamed Mussels with Pan-Fried Tater Skins and Sautéed Greens with Saffron White Sauce won the #FoodChamp online recipe contest, earning her a place in the seafood competition. Join chefs Emily Ellen, Beth Patterson and Ally Phillips for Inspired Home cooking demonstrations on November 7th and 8th. These demos are free to the public and will take place each day at 11:00 am and 3:00 pm at one of our beautiful ChampionsGate model homes as well as at the stunning Oasis Clubhouse at ChampionsGate rotunda. Each demonstration will showcase an emerging houseware product or trend. Oasis Rotunda: At 1:00 pm Beth Peterson will demo her 2013 World Championship winning Italian Mac & Cheese. This cheesy treat includes campanelle pasta and Pancetta wrapped in a delicious six Italian cheese blend topped with a crunch of Parmesan spiked panko broiled up to perfection. Oasis Rotunda: at 1:00 pm Jennifer Daskevich, 2013 World Sandwich Champion, will demo her winning Fried chicken sliders with an apricot root beer bacon jam and a chipotle sauce with fresh basil on brioche slider buns. Parking is available at the Oasis Club house located at 1520 Oasis Club Blvd. ChampionsGate, FL 33896. The demo home is a right next door at 1403 MoonValley Drive.